Ethnic set on white background. 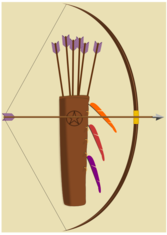 Bow with arrows, a hunter's hat, a target. Tribal collection of hand drawn elements in boho style. Feather, tipi and arrows. Vector illustration. An archery retro set. Hunting season. Flat and Cartoon style. Vector illustration. Little boy with a cold shivering cartoon vector. Little girl with a cold shivering cartoon vector.